Mondini deformity refers to the absence of the apical modiolus and interscalar septum, resulting in an incomplete partitioning of the cochlea together with an enlarged vestibular aqueduct (EVA) and dilated vestibule. It was first described in 1791 by Carlo Mondini after dissecting the inner ear of an 8-year-old deaf boy. In 1987, Jackler et al proposed a classification system of inner-ear malformations that was based on specific dates of cessation of cochlear development. Cessation of development at the fifth week caused cochlear agenesis, cessation at the sixth week produced cochlear hypoplasia, and developmental cessation at the seventh week produced a small cochlea that was incompletely partitioned with resultant 1.5 turns. This classification system was created using polytomography, a form of imaging that has now been discarded and since replaced with high-resolution CT imaging, which is superior in its resolution to polytomography. In 2004, Sennaroglu and Saatci created a modified classification system for incomplete partition of the cochlea to help differentiate different forms of incomplete partitioning. Using a retrospective review of temporal bone CT scans from patients with sensorineural hearing loss, the researchers were able to ascertain two variants in the their study population. The first variant, termed incomplete partition type I (IP-I), demonstrated a cochlea that was without the entire interscalar septum and the modiolus, resulting in a cystic appearance. While the vestibule was found to be dilated when compared to a normal temporal bone, enlargement of the vestibular aqueduct was rare. Incomplete partition type II (IP-II) demonstrated a cochlea that had a normal basal turn; however, the apex was cystic in appearance owing to absence of the modiolus and the corresponding interscalar septum. Additionally, the vestibule was mildly dilated and the vestibular aqueduct was enlarged. The IP-II malformation is the deformity described by Carlo Mondini and is the basis for the title Mondini deformity. Schematic representation of the normal cochlea and cochlear malformations. 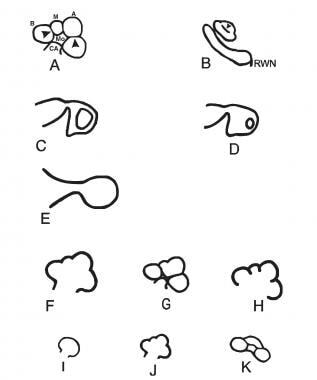 A: normal cochlea, mid-modiolar section; Mo = modiolus, CA = cochlear aperture, B = basal turn, M = middle turn, A = apical turn, arrowheads = interscalar septa. B: Normal cochlea, inferior section passing through the round window niche (RWN); arrowhead = interscalar septum between middle and apical turns. C: Cochlear aplasia with normal vestibule. D: Cochlear aplasia with enlarged vestibule. E: Common cavity. F: Incomplete partition type I. G: Incomplete partition type II. H: Incomplete partition type III. I: Cochlear hypoplasia, bud type (type I). J: Cochlear hypoplasia, cystic cochlea type (type II). K: Cochlear hypoplasia, with less than 2 turns (type III). Not all congenital malformations of the inner ear result from SCL26A4 gene mutation. This is an interesting finding because the various types of cochlear malformation have always been thought of as a continuum of defects, all due to developmental arrest at some embryological stage. The prognosis of Mondini deformity varies. Depending on the degree of malformation of the cochlea, sensorineural hearing loss can range from nonexistent to profound. Mondini C. Anatomica surdi nati sectio. De Bononiensi Scientiarum et Artium Instituto atque Academia Commentarii. 1791. 7:28–9:419–31. Lo WW. What is a 'Mondini' and what difference does a name make?. AJNR Am J Neuroradiol. 1999 Sep. 20(8):1442-4. [Medline]. Hartley, G. The Minor Works of Carlo Mondini (Carlo Mondini). The American Journal of Otology. 1996. 18:288–293. Jackler RK, Luxford WM, House WF. Congenital malformations of the inner ear: a classification based on embryogenesis. Laryngoscope. 1987 Mar. 97(3 Pt 2 Suppl 40):2-14. [Medline]. Sennaroglu L, Saatci I. Unpartitioned versus incompletely partitioned cochleae: radiologic differentiation. Otol Neurotol. 2004 Jul. 25(4):520-9; discussion 529. [Medline]. Sennaroglu L, Sarac S, Ergin T. Surgical results of cochlear implantation in malformed cochlea. Otol Neurotol. 2006 Aug. 27(5):615-23. [Medline]. Everett LA, Glaser B, Beck JC, Idol JR, Buchs A, Heyman M. Pendred syndrome is caused by mutations in a putative sulphate transporter gene (PDS). Nat Genet. 1997 Dec. 17(4):411-22. [Medline]. Molecular Otolaryngology Research Labs. Pendred/BOR Homepage. Available at http://www.healthcare.uiowa.edu/labs/pendredandbor. Accessed: Oct 12, 2011. Azaiez H, Yang T, Prasad S, Sorensen JL, Nishimura CJ, Kimberling WJ. Genotype-phenotype correlations for SLC26A4-related deafness. Hum Genet. 2007 Dec. 122(5):451-7. [Medline]. Wu CC, Yeh TH, Chen PJ, Hsu CJ. Prevalent SLC26A4 mutations in patients with enlarged vestibular aqueduct and/or Mondini dysplasia: a unique spectrum of mutations in Taiwan, including a frequent founder mutation. Laryngoscope. 2005 Jun. 115(6):1060-4. [Medline]. Campbell C, Cucci RA, Prasad S, Green GE, Edeal JB, Galer CE. Pendred syndrome, DFNB4, and PDS/SLC26A4 identification of eight novel mutations and possible genotype-phenotype correlations. Hum Mutat. 2001 May. 17(5):403-11. [Medline]. Wang QJ, Zhao YL, Rao SQ, Guo YF, Yuan H, Zong L. A distinct spectrum of SLC26A4 mutations in patients with enlarged vestibular aqueduct in China. Clin Genet. 2007 Sep. 72(3):245-54. [Medline]. Fitoz S, Sennaroglu L, Incesulu A, Cengiz FB, Koc Y, Tekin M. SLC26A4 mutations are associated with a specific inner ear malformation. Int J Pediatr Otorhinolaryngol. 2007 Mar. 71(3):479-86. [Medline]. Wu CC, Chen PJ, Hsu CJ. Specificity of SLC26A4 mutations in the pathogenesis of inner ear malformations. Audiol Neurootol. 2005 Jul-Aug. 10(4):234-42. [Medline]. Incesulu A, Adapinar B, Kecik C. Cochlear implantation in cases with incomplete partition type III (X-linked anomaly). Eur Arch Otorhinolaryngol. 2008 Nov. 265(11):1425-30. [Medline]. Mylanus EA, Rotteveel LJ, Leeuw RL. Congenital malformation of the inner ear and pediatric cochlear implantation. Otol Neurotol. 2004 May. 25(3):308-17. [Medline]. Kontorinis G, Goetz F, Giourgas A, et al. Radiological diagnosis of incomplete partition type I versus type II: significance for cochlear implantation. Eur Radiol. 2012 Mar. 22(3):525-32. [Medline]. Sennaroglu L. Cochlear implantation in inner ear malformations--a review article. Cochlear Implants Int. 2010 Mar. 11(1):4-41. [Medline]. Chen X, Yan F, Liu B, et al. The development of auditory skills in young children with Mondini dysplasia after cochlear implantation. PLoS One. 2014. 9 (9):e108079. [Medline]. [Full Text]. Incomplete partition anomalies of the cochlea. A and B: Incomplete partitions. Cochlea (C), without the modiolus and interscalar septa, resembles an empty cystic structure (A) and is accompanied by dilated vestibule (v) (B). C and D: Incomplete partition type II. The apical part of the modiolus and the corresponding interscalar septa are defective (black arrow), giving the apex of the cochlea a cystic appearance due to the confluence of middle and apical turns (C). This is accompanied by minimally dilated vestibule (v) and large vestibular aqueduct (white arrow). E: Incomplete partition type III. Cochlea has interscalar septa (black arrow), but the modiolus is completely absent. Published by Cochlear Implants International.